Last week, I received a brand new toy! 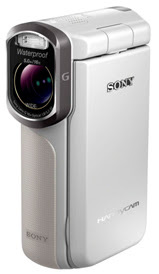 Thanks to SONY Singapore, I was gifted the all-new HDR-GW77 Handycam. And unlike the other normal videocams, this one is waterproof (at depth of up to 5 metres), dust resistant and shockproof against falls of up to 1.5m. I think this one has been made with my cheekiemonkies in mind... considering they are still below the height of 1.5m and still prone to having butterfingers at times. Add the swivel 3" LCD touch screen and a Swing Panorama function that records the whole sweep of the landscape with a single press of the shutter button, I think this ranks as the perfect companion to bring on our road trips and holidays. Oh, other than my dear wifey and monkies of course. Just see how excited the 2 boys were when they caught a first glimpse of the GW77 Handycam. What I especially liked about this Handycam is that it is super lightweight and very convenient to bring around to capture video moments. Sure, my DSLR can record videos too but it weighs a ton and my hands feel like lead after a few minutes with it. Well, I could go on and on about its other features, like the in-built “EXMOR R” CMOS Sensor which makes taking high quality video even in dimly-lit locations a piece of cake, or its Optical Steady-Shot with Active mode which pushes the 10x optical zoom to a maximum magnification of 17x with no fear of a shaky image. But I rather not. And for the geeks out there, here are the specifications in detail. The SONY HDR-GW77 comes in the colours of white, black or blue, and will be available in Singapore at all SONY stores and authorised outlets from 12 July 2012.